At Global Ed Forum, we had many terrific discussions with educators who share our passion for bringing global education into classrooms around the world. On October 13-15, teachers, administrators, organizations and education experts came together at the Global Education Forum in Philadelphia to celebrate learning, share ideas and discuss the critical need for global education in all schools across the world. If I could describe the Global Education Forum in one word it would be connections. First, we were thrilled to make live global connections right at the conference Thanks to the joint efforts of VIF, Shared Studios, The Qatar Foundation, P21 and Level Up Village (LUV), conference attendees were able to converse first with Syrian refugees and then with LUV’s global partners in Pakistan and Nicaragua. It was so exciting to see some of our students showing off their 3D printed solar flashlights from their Global Inventors course and teachers answering questions about what it’s like to teach in each country. We also shared our mobile-friendly global collaboration platform and explained how it’s turning regular classrooms into global classrooms, where students reach across the world to connect and collaborate with one another. Many educators we spoke to are interested in bringing our pioneering global STEAM programs and leading-edge tech to their schools, and we look forward to forging these new partnerships! Students in 20+ countries connect and collaborate using Level Up Village’s mobile-friendly Global Communications Platform. This boy in New Jersey is paired with a girl in Nablus for LUV’s Global Inventors 3D printing course. Together they’re learning about the engineering design cycle and will co-design and 3D print a solar powered light source. 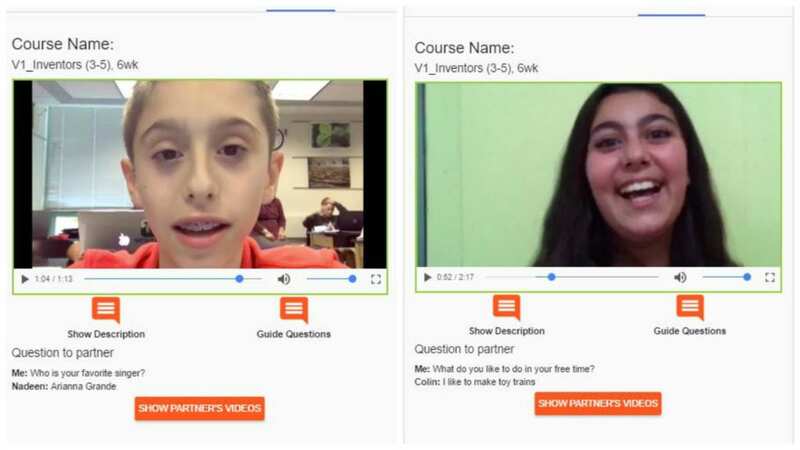 This type of innovative global STEAM collaboration with real-world applications teaches important 21st Century skills and aligns with many Common Core and Next Generation Science Standards. The conversations during and between sessions were robust and thought provoking, and the knowledge and experience of the participants provided a deep well for future collaborations, not to mention all of the ways we are connecting students around the world to their learning and to each other. Indeed, this forum provided multiple ways to dig into what global education really means in our world and how to provide the best opportunities for ALL students to have access to a global education. Most importantly, the educators at the conference agreed that a shift is necessary to make “global education” the norm to the point where it becomes viewed simply as “education” because the global component is inherent. Level Up Village is proud to be working toward making all of these ideas possible, and we’re already looking forward to #GEF17! Sounds like an amazing gathering of global, child-minded people! Mahalo for sharing.